As Science Borealis’ new math and statistics editors, Andrew and Auriel aim to clear the fog of misconception from statistics and make them more accessible, while also demonstrating how fun and rewarding a career involving math and statistics can be. There was a time in Auriel’s life (well, really, there was the entire beginning part of her life) when she hated math. She wanted to study birds, and in her mind that meant she didn’t need math and would never use it. She graduated from high school planning to move past this whole “math” thing and study wildlife ecology. The problem is, her mother was right (again), and math is actually super useful. But it wasn’t until graduate school that Auriel really understood why, and also began to embrace statistics. 18-year-old Auriel would laugh, long and hard, at this image, but she and statistics now spend part of most working days together analyzing data, writing code, or working on other parts of the data crunching process. Auriel holding a rail (wetland bird). Andrew first saw real quantitative ecology in action in a small shack on a deserted island, hidden in the Atlantic fog. He was an undergraduate on his first real field course: two weeks on Bon Portage Island, off the coast of Nova Scotia. As in all field courses, there was a lot of group fieldwork: counting periwinkles and Fucus sp., counting birds, measuring plants. Finally, each group would troop down the hill to where Professor Dave Shutler sat shrouded in fog in a small shed. He’d type the numbers in, hit a few buttons, and run something called a “GLM” (a Generalized Linear Model). Statistics was transformed from a plodding subject about flipping coins, into a subject deeply connected to the animals, plants, and environment of this small island. Unfortunately, statistics were still very mysterious, and Andrew’s knowledge of them was as small and indistinct as that tiny island in the Atlantic fog. But during his Masters degree he met a tropical ecologist named Cam Webb who introduced him to R, a programming language that specializes in working with data and statistics. Andrew loved it. It’s an excellent tool for a field ecologist (or any scientist): freely available, flexible, and with a huge community to help a beginner learn. Auriel now spends her time using models to understand bird migration. These models allow her to take survey data of birds (in her case wetland birds called rails) and model bird abundance in relation to different variables, such as wetland water depth. 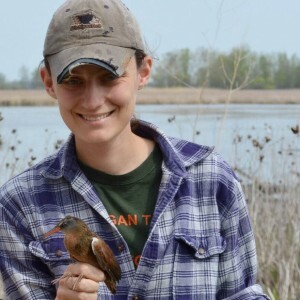 Her model results will help manage wetlands for rails and other species by providing critical information such as how deep to flood wetlands for rails, and what kind of plants they like to eat. Models like these are used by non-profit and government organizations to answer questions about how to manage habitat, allocate money for conservation planning, and understand what might happen to a range of species in the future. Andrew is studying the community of invertebrates that lives inside plants called bromeliads, which are found throughout the Neotropics. They collect rainwater in their leaves, and these tiny pools of water are home to many small flies, beetles, and damselflies. It’s a perfect setting for studying the ecology of small, discrete habitats. Andrew spends a lot of time in R doing multivariate statistics, generalized linear models (no longer completely mysterious! ), and randomization tests. Randomization tests are an important way to think about the patterns we see in ecological communities. For example, if you find that some species are only found in large habitats, does that mean that they actually prefer large habitats? Or could it be that larger habitats have more individual animals, and therefore a bigger chance of containing any specific species? Randomization tests let you ask what patterns you would see in your data if there were “no biology”—in this case, no preference for different sizes of bromeliads! While both Auriel and Andrew study ecological systems, mathematics and statistics have wide-ranging applications in many fields, from physics to engineering to economics to politics. Advanced statistics can be very complex, but understanding how statistics works—and how to interpret the results of simple models and tests—is vital to interpreting the world around us. This includes assessing risk, as well as understanding the natural variation in most systems, and what level of change in a variable is actually a cause for alarm. Understanding statistics can help you make informed decisions about things in your daily life, such as deciding how risky an investment or decision is, or understanding the effectiveness of a particular medical treatment. Statistics can also help you make informed opinions about policies, laws, and ideas, by allowing you to see past the rhetoric to determine whether the science backs up a new policy. So if you’ve always been afraid of math and stats, tune in here as Andrew and Auriel provide advice and encouragement along the road to becoming math and stats savvy! Mathematics and Statistics Andrew Macdonald, Auriel Fournier, biology, bird migration, conservation, ecology, math, statistics, wetlands. permalink.